The Sultanate of Oman is the oldest independent state in the Arab world. Tourism is on the rise, with diving being one of Oman's attractions. The coastline extends 1700 km from the Strait of Hormuz in the north, to the Republic of Yemen in the south and borders three seas - the Arabian or Persian Gulf, the Gulf of Oman and the Arabian Sea. Of these the best diving is in the Arabian Sea. The capital is Muscat (Masqat), in the North East. Richard Field, in his book Reef Fishes of Oman, says that there are probably between 1300 and 1500 different species of fish to be found in the coastal waters of Oman. Most can be seen elsewhere in the Indo-Pacific region, but there are some that unique to this area and could be called 'Arabian' species. The diversity of marine species is greatest in the Arabian Sea, and declines northward through the gulfs. The northerly Arabian Gulf is very shallow - its average depth being only 35 m. This means that the temperature fluctuates greatly around the coast from about 10 oC in winter to as much as 35oC in summer. It is also very salty due to high evaporation and low rainfall. A combination of these factors explains the relatively few species in this area. Most of the diving in Oman is therefore further south. The main diving areas are the Daymaniyat Islands, Fahl Island and the Musandam peninsula. It is common to dive in Oman without a guide, but if you ask for one you will be accompanied. Although you can dive year round, the best time to go is from April to October. A large number of mainly peaceful protests took place in 2011, with a wide range of demands, including more jobs, higher salaries, increased media freedoms and an end to corruption. In response to the protests, the head of state - Sultan Qaboos - announced a number of reforms and issued instructions to avoid causing loss of life at all costs. At the time of writing, there are no major concerns about travel to Oman: for more on the country and travel advice see the British Foreign and Commonwealth site. You should of course take out diving and travel insurance before you go. If you are travelling to Oman with prescription drugs, carry a copy of the prescription. Your passport should be valid for a minimum period of 6 months from the date of entry into Oman. Have you dived in Oman? Review the diving centre or liveaboard you used. Want to know more about the dive sites - see below. This liveaboard is a charming, traditional wooden boat for those who want to unveil the hidden treasures of the Musandam Peninsula. She departs from Dibba on a Sunday for 7 nights. 24 m long, she has 6 cabins accommodating 12 divers. Departs from Dibba on a Sunday for 6 nights. 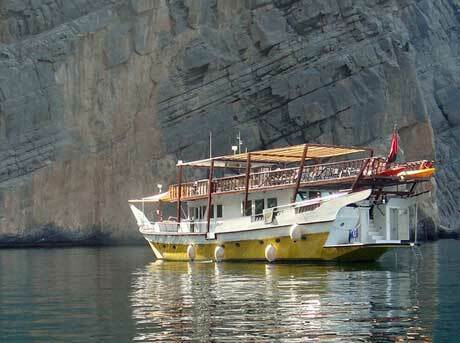 The cheapest Oman liveaboard option. 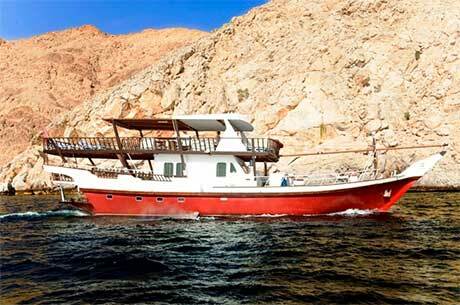 This custom-built fiberglass Red Dhow has 3 decks, cabins with private bathrooms and a roomy main salon. She features inside and outside dining. She is 23 m long and has 8 cabins for 16 divers. The Oman Aggressor offers a luxury experience including evening entertainment, games and 400 films available in the main salon or your stateroom. It even has a hot tub. Departs on a Saturday for seven nights from the Port of Salalah (Mina Raysut). This is a big boat, 45 m long with 11 cabins for 22 divers. Currently 35% off! "A good, safety-conscious dive operation, with Nitrox, & offering up to 3-4 dives a day if desired. Marina & the Extra Diver cabins are next to a large resort (Shangri la), but there does not seem to be much else nearby. Boats spacious & shaded, but no marine head. Good plentiful tank racks, well organised boat. Good value for money." "Great DM guide (Nash) who is knowledgeable & passionate about marine life. Sea Oman are waiting for government permissions to offer Nitrox, this will be a great addition. And they have a convenient air-con office & dive school area at the head of the marina close to the boat, with plenty of parking & a convenient hotel nearby, all about 15 mins from Muscat airport. Sea Oman have great skippers who also teach diving (Faisal, Jomar) & fast boats with good shade, plenty of space & a marine head. Sea Oman (Yousuf) also recommended the very nearby hotel Mysk, which is a great hotel, new & with an elegant feel yet not expensive. The hotel is also at the head of the marina, and about 100m walk from the dive centre, and both have parking nearby. Good value for money. Wholeheartedly recommend both Sea Oman and Mysk Hotel, and Oman diving in general. I will be back in a season with better viz, I hope, but I'd still come again at this time. " Based in Muscat near the international airport. Use the Daymaniyat Islands as the primary dive sites. 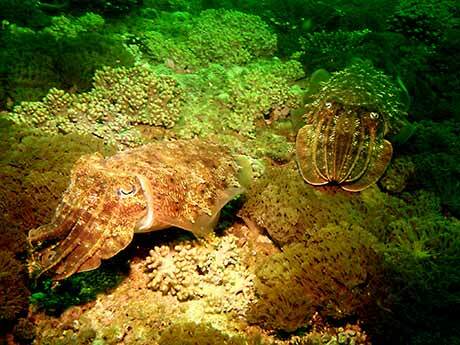 Dive Daymaniyat Islands, Bandar Khayranthere and Fahal Island. The Daymaniyat Islands are the first Marine Reserve in Oman. The coastguard hut on Police Island has been turned into a hut for the park wardens, who monitor the boat traffic within the reserve. The fee for diving within the reserve is 4 OMR per day. The best diving is from April to October. There are nine Daymaniyat islands, distributed over 50 km in 3 groups: Western, Central and Eastern. They shelter nesting populations of Hawksbill and Green Turtles. The nearest airport to the Daymaniyat Islands is Muscat, the capital. We stayed with Al Sawadi Beach Resort, who organised transfer from the airport. The main sites are shown on maps above, but remember there are big distances between each of the groups. When we were there, in August, there was a significant plankton bloom, and the visibility on the eastern islands was much worse than around the western islands. Because of deep ocean upwellings the water below about 10 m was also quite chilly (22 degrees C). A 3 mm wetsuit is adequate although on a second dive you begin to feel it. The islands have shallow sandy seabeds on the Oman side, but on the northern side there is a steep drop off and even some walls. Typical maximum depths on dives range from 20-28m. The features are very healthy hard and soft corals, with very little damage. Lots of shoaling fish, very many moray eels and stone fish and cuttlefish. There are also some very large crayfish, and some small crabs around. Turtles are frequently seen, and some huge ones at that. From July to September the plankton bloom also attracts whale sharks, so with a bit of luck the opportunity may arise to snorkel with one these.
" Sea mount with good variety & density of life. Now in August, visibility not great but offset by seeing a juvenile whale shark briefly whilst descending, and cuttlefish laying eggs, as well as free-swimming morays, large nudibranchs, stingrays and other fun life. There was a bloom of large salps (chains of see-through jelly-like creatures) but these large ones do not sting. " " On the eastern-most island the Aquarium dive is reported to be one of the best for meeting the larger sea life. " " Low viz made these sites a bit more work, but a huge bull ray (bigger than me!) was a treat worth it. Turtles, big Arabian angelfish, slipper lobsters, many damselfish with eggs. Sadly also currently a large number of Crown of Thorns are impacting the coral. The operator, Sea Oman who are great, have flagged this to the government to possibly take action. Sites include The Noodle, Police Run (on Police Island) & others. " " We particularly enjoyed the Hayut Run dive because of the turtles and huge stingray. " " The dive around Sira island had the best visibility and beautiful coral life. " " Daymaniyat Islands have a fantastic visual display of corals. Big leopard sharks, rays, turtles, lots of moray eels, scorpion and stone fish, barracuda, amazing variety of large shoals of fish and the occasional reef shark. Whale sharks if you're lucky. Fantastic experience, I would definitely recommend it. " " Good, gentle diving. I visited Oman at Easter, the water temperature was a warm 26 degrees, and a 2/3mm wet suit is fine. It's a great place for the novice or for people who don't like deep diving as you are unlikely to get much below 15 - 20 m in most of the regular dive sites. Saw the usual culprits: sweetlips, cuttlefish, turtles, morays, etc - lots, really. The corals were mostly hard: cabbage and plate, staghorn plus anemone coral. Not quite the same standard as say the Red Sea, but not bad nonetheless. Oman itself is a great place to visit. You must hire a car and take time out to visit fishing villages and old Portuguese forts. There are 2 main dive centres in Muscat. As I did not want to stay in a posh hotel, who have their own dive operator or sub to Blue Bubbles, I stayed and dived with the Oman Dive Centre, whom I completely recommend. " The MS Mimoona wreck at at Quriyat lies from 8-16 m.
Deliberately sunk in 2003 by the Royal Navy of Oman as an artificial reef, this relatively new wreck is already full of life and attracts large shoals of fish. It is 26 m at its deepest point and reaches up to 8 m.
"Perfect length & depth wreck for a long slow dive, and good depth (10-30m) for Nitrox. Large schools of fish (grunts & snappers), esp. off the bow. Beautiful soft coral growth, especially along the semi-open companionways (but please be careful with your fins & minimise your bubbles if you swim through there). Stern has under-hangs where marble rays & crocodile fish hang out. Bow at sea bed has a large area of the hull that swings back & forth, and the booms inside the ship are very atmospheric. From the deck & doorway areas, lots of glassy sweepers & other schooling fish inside, plus everything from free swimming morays, to little nudibranchs. Viz was not great in August, but still very enjoyable dive (and only our boat there). " "I was almost put off by the dive-site name, but this site was pretty, with an ethereal feel due to the countless purple sea fir corals flowing in the gentle surge. Large broomtail wrasse, many puffer fish, moray eels of at least 4 varieties, a cuttlefish, and patches of reasonable viz despite the time of year. Here the salps are smaller (1 ft chain with small 1cm feathery areas) and can sting. " Musandam is a ferry-ride away from Muscat. It offers sheltered sites and some great drift-diving. You sometimes see whale sharks. You'll find a dive centre in Khasab or can take a liveaboard. This inland sea links with the Gulf of Oman by the Strait of Hormuz. It borders Iran, Oman, United Arab Emirates, Saudi Arabia, Qatar , the island of Bahrain, Kuwait and Iraq. You can dive here but the diving is better further south in Oman.
" The Arabian Gulf is mucky and not as good as the Red Sea. They do have some neat fish but that is about it. They throw buses and cars in the water as a natural coral. The visibility is about 3 meters. Stick with the Red Sea. " Al Sawadi is a beach resort north west of Muscat. It takes about 45 minutes by car from Muscat airport. The resort has been managed by Extra Divers since early 2011. The resort guests mainly come from Italy, Germany and France, with a few Brits. Al Sawadi is quite a large resort, with a small village of Barka some distance away, but within walking distance if the weather is not too hot. Photographic reference guide helps divers identify the reef-dwelling fishes of Oman. Well-written, it tells you exactly what you need to know to identify the fish in the Arabian Gulf, Gulf of Oman and Arabian Sea. A snip at just 5.99 Euro. You can also download this as an app from the apple store or as a a Kindle book. Although not specifically about Oman, Coral Reef Guide Red Sea mentions when a fish may also be found in Oman. Each species is illustrated with a full-colour photograph and the text gives details of range and characteristic behaviour. A map of good dive sites appears on the inside front cover. Includes jellyfish, corals, nudibranchs, starfish, sea urchins, fishes and turtles. Set in 1955, Jan Morris accompanies Sultan Said on the first ever crossing of Oman by motor vehicle. Please send us your comments on Oman. Do you want to recommend a diving centre or dive site? Let us know. If you own a dive centre get yourself added.